Advertisements playa very important role in forming attitudes/preferences for brands. Often advertisers use celebrity spokespersons as a credible source to influence consumers’ altitudes and purchase intentions. Another type of source credibility is corporate credibility. which can also influence consumer reactions to advertisements and shape brand attitudes. In general. it has been found that forlow-involvement products, attitude toward the advertisement mediates brand cognition. (beliefs about the brand) and attitude toward the brand. What would happen to the effect of this mediating variable when products are purchased through a home shopping network? Home Shopping Budapest in Hungary conducted research to assess the impact of advertisements toward purchase.Asurvey was conducted where several measures were taken, such as attitude toward the product, attitude toward the brand. attitude toward the ad characteristics, brand cognitions, and so on. It was hypothesized that in a home shopping network. advertisements largely determined attitude toward the brand. In order to find the degree of association of altitude toward the ad with both attitude toward the brand and brand cognition. a partial correlation coefficient could be computed. The partial correlation would be calculated between altitude toward the brand and brand cognition after controlling for the effects of attitude toward the ad on the two variables. If attitude toward the ad is significantly high. then the partial correlation coefficient should be significantly less than the product moment correlation between brand cognition and attitude toward the brand. Research was conducted that supported this hypothesis. The partial correlation coefficient is generally viewed as more important than the part correlation coefficient because it can be used to determine spurious and suppressor effects. The product moment correlation. partial correlation. and the part correlation coefficients all assume that the data are interval or ratio scaled. If the data do not meet these requirements. the researcher should consider the use of non metric correlation. 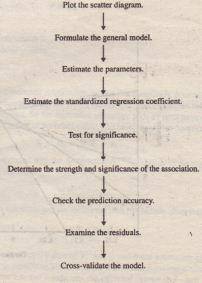 The steps involved in conducting bivariate regression analysis are described in Figure 17.2. 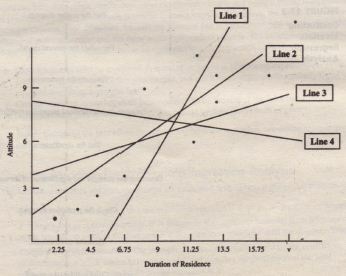 Suppose the researcher wants to explain attitudes toward the city of residence in terms of the duration of residence (see Table 17.1). In deriving such relationships. it is often useful to first examine a scatter diagram. relationship between the variables. A plot can alert the researcher to patterns in the data, or to possible problems. Any unusual combinations of the two variables can be easily identified. 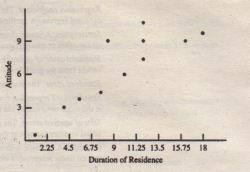 A plot of Y (attitude toward the city) against X (duration of residence) is given in Figure 17.3. The points seem to be arranged in a band running from the bottom left to the top right. One can see the pattern: As one variable increases, so does the other. 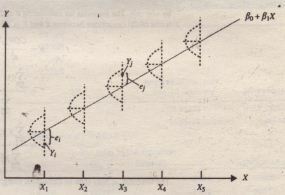 It appears from this scatter gram that the relationship between X and Y is linear and could be well described by a straight line. However, as seen in Figure 17.4, several straight lines can be drawn through the data. How should the straight line be fitted to best describe the data? Which Straight Line Is Best. from the point to the line is the error, ej (see Figure 17.5). The distances of all the points from the line are squared and added together to arrive at the sum of squared errors, which is a measure of total error, Ie}. In fitting the line, the least-squares procedure minimizes the sum of squared errors. If Yis plotted.on the vertical axis and X on the horizontal axis, as in Figure 17.5, the best-fit ling line is called the regression of Yon X, because the vertical distances are minimized. The scatter diagram indicates whether the relationship between Yand X can be modeled as a straight line and, consequently, whether the bivariate regression model is appropriate. X = independent or predictor variable .